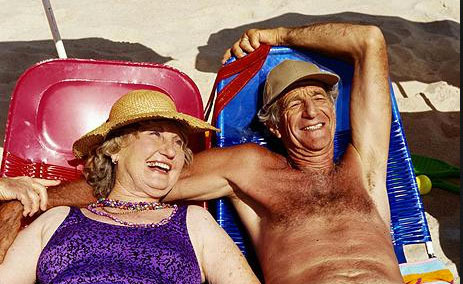 Whether in summer or winter, people often enjoy a tanning session under the sun and seniors are no exception. A healthy dose of sunlight can do wonders for your health and well being. However, sunburn due to overexposure can often lead to unnecessary suffering and sometimes even cancer. With this in mind, let’s talk about how you can protect yourself while lounging in the sun and soaking up those golden rays. While vitamin D can also be found in some fish oils and supplements, sunlight is a major and easily accessible source of the vitamin. For example, exposing 5% of the uncovered body twice a week in summer will be equivalent to the intake of a vitamin D supplement daily. For those suffering from osteoporosis, this vitamin is extremely important as it improves bone health, density and prevents fracturing. Studies have also found that vitamin D directly improve muscle health reducing the risk and damage of falls in older people. Furthermore, vitamin D has also been found to be beneficial to those suffering from cancer, multiple sclerosis, osteoarthritis and hypertension. Other than vitamin D, sunlight has also been found to have a positive affect as to the moods and feelings of people. People have reported an uplifting feeling when exposed to sunlight and exposure to sunlight has been found to help when coping with depression. With all these benefits, shouldn’t we just go outside and stay in the sun all day? As with anything else, too much of a good thing makes it a bad thing and sunlight is no exception. Overexposure to sunlight can cause horrible sunburn and in more extreme cases may lead to skin cancer. Along with vitamin D, sunlight also carries Ultraviolet radiation. Normally not harmful to the human body, ultraviolet radiation assists the skin in its conversion of vitamin D which in turn benefits the body. However, once the vitamin D intake in your body crosses a certain point the ultraviolet radiation begins to then convert vitamin D into compounds(Lumisterol & Tachysterol) which are biologically inert and do absolutely nothing for the body. When under the sun, exposure of approximately 5 minutes of noontime summer sunlight for 2 to 3 times a week will best satisfy the body’s need for vitamin D. Also, when being exposed to sunlight for longer times, for example at the beach, always where sunscreen and a hat. Also, when spending longer times exposed to the sun, always remember to drink lots of water in case of dehydration. If in a wheelchair, a walk in the park with family or friends is a good way to get exposure. In short, leaving the house once in a while and enjoying the sunlight is a sure way to get healthy and stay happy. Source: Lim, H., Gilchrest, B., & Cooper, K. (2005). Lim HW, Gilchrest BA, Cooper KD, Bischoff-Ferrari HA, Rigel DS, Cyr WH, Miller S, DeLeo VA, Lee TK, Demko CA, Weinstock MA, Young A, Edwards LS, Johnson TM, Stone SP. Sunlight, tanning booths, and vitamin D. J Am Acad Dermatol 2005;52:868-76 (May). Journal of the American Academy of Dermatology, 53(3), 495.